Well, as I mentioned in my previous post, life has gotten in the way over the last couple of weeks with an horrific combination of work and personal dramas, which is why I haven't posted anything. I may write about it one day but right now I just need to sit still for a while. #35 - I took a hiatus from the whole excercising four times per week thing, and, for reasons I may discuss at a different date, the goals on that one will change a little. But I'm not feeling terriby unfit as a result. Heh heh heh. Famous last words, no doubt - we'll see how I REALLY feel when I hit the gym on Monday! I'm a little scared, truth be told... I also haven't really kept up my food diary but I'll see if I can think back and remember. For someone with such appalling recall of important information, I'm quite skilled at telling you what I ate last Tuesday! #65 - To read all my unread books before buying more. The next one on my list was Heart of Darkness by Joseph Conrad. You can check out my review here. I have a bit of an idea up my sleeve to check a few items off in one fell swoop, mostly cooking ones. I'm in the sort of frame of mind right now where I have this drive to achieve things. We shall see. A lot will depend on my energy levels, and they have been substandard of late, which kind of thwarts my drive to achieve things. My energy levels have been SO substandard, in fact, that it's only 5:53pm on a Saturday as I write this, and I'm already entertaining thoughts of going to bed. I know it's sad but sometimes you've just got to look after yourself. Viv, I don't know if you read this, but if you do, sorry I'm not at your birthday drinkies. It's because I'm a sad old nanna who needs to take a break from it all, not because I don't love ya! I've also realised that #87 to #91 as well as #101 are in progress: Listen more attentively; Interrupt less readily; Write more neatly, no matter how much of a hurry I am in; Prepare properly for meetings; Be sufficiently auditable at any moment in time; Make friends with my cousins. I have a long way to go on all of those things, but I've made a start. The first few are the sum of little changes you make every day, and the latter was nudged along by my trip to Brisvegas, where I caught up with my aunty Glennis (not technically my aunty anymore, but she was 25 years ago and I always have and always will consider her to be a relative) and my cousins Darren and Annette. It was great to see them all. 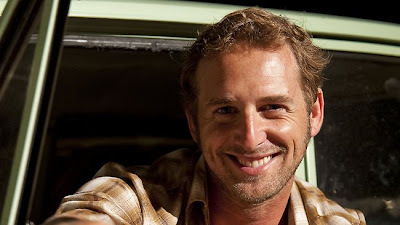 Josh Lucas: Animal lover and all-around rugged hottie with the most excellent dimples and just the kind of cheeky smile that I love. Yum.